Provincial Powers Law Revisions, Elections Results for Anbar and Nineveh: Is Iraq Headed for Complete Disintegration? A number of important political developments in Iraq this week have failed to receive the attention they deserve, especially for the light they cast on the perennial question of Iraq’s territorial unity in the face of real and imagined schemes of disintegration. A good place to start are the provincial powers law “revisions” that were passed by parliament on Sunday. The word “revision” is somewhat misleading, since it can be argued that the new changes are so dramatic that they amount to a rewrite of the original law from 2008. Article 7-4: It is for the first time specifically stated that in an area of shared competency between the central government and the governorate, the policy of the governorate shall prevail. Article 7-6: The governorate is given responsibility for all state officials in its jurisdiction – significantly no longer excepting the courts, the military and the universities which had previously been designated a central government preserve. Article 7-9: Whereas the ministry in Baghdad was formerly involved in picking top officials of the various government departments operating in the governorates, the selection process is now exclusively limited to the governor and the governorate council. Article 31-10: Whereas the military was previously expressly excepted from the authorities of the governor, this no longer applies and an ambiguous shared power formula is outlined. Article 44: Revenues for the governorates are for the first time specified in law (rather than being the subject of annual budget negotiations). This includes 5 petrodollars per barrel of oil or 150 cubic metres of natural gas. Various potential taxes are mentioned, including the right of governorates to tax companies for damages to the environment. Article 45: This was formerly a vague cooperation council between the central government and the governorates. The council is now being tasked with transferring, within 2 years, control of all governorate-based government departments under the following ministries to local authorities: Municipalities, housing, employment and social issues, education, health, agriculture, finance, sports. If the transfer is not complete within 2 years, the transfer will nonetheless be considered a legal fact. Henceforth, the role of the ministries will be limited to “general planning” only. It has been suggested that these dramatic changes were acceded to even by sceptics as an alternative to the creation of federal regions. The question is: What is the point in arguing about the creation of federal regions when this law effectively transforms Iraq into a confederation consisting of all its governorates plus the virtually independent Kurdistan? Is it perhaps just the word “federalism” they fear more than anything else? Do Iraqi politicians realise the implications of giving governorate decisions priority in areas of shared competency? It is for example very hard to see any exemption of the oil and gas sector from the general scheme of provincial dominance, since energy is specifically referred to in the new law through a reference to article 112 of the Iraqi constitution. Whereas decentralisers among the Kurds and ISCI will have been very happy with these new changes, it is more surprising to find Iraqiyya and the State of Law alliance of Prime Minister Nuri al-Maliki backing them in a parliamentary session with unusually high attendance (217 out of 325 deputies). Of course, parts of Iraqiyya have long been drifting in a pro-federal direction, and with even Ayyad Allawi calling for widespread decentralisation of services. More surprising is the apparent green light from Maliki, whose parliamentary allies reportedly objected only to an initial article that further limited the powers of the Iraqi army locally – and who expressed satisfaction at the compromise that later emerged on this. Maybe it is the complications of government formation after the 20 April local elections that have prompted this apparent outburst of modesty on the part of State of Law? More theoretically speaking, even if this law was adopted as a safeguard against the creation of federal regions it is hard to see why the pressures were perceived as being so acute at this time. Firstly, there are the recent (delayed) provincial elections results from Anbar and Nineveh. After pro-federal winds have been blowing over the Sunni-majority parts of Iraq for some time, there is nothing in these results to suggest the existence of an overwhelming demand for new federal regions in north-western Iraq. True, the Mutahiddun bloc of parliament speaker Usama al-Nujayfi picked up 8 seats in each of these two provinces. But politicians with more anti-federal agendas (Mutlak, Karbuli, local lists etc.) achieved the same number of seats in Anbar and Nineveh and will make coalition forming something of a challenge for Nujayfi (on top of the fact that the Kurds emerged as the biggest bloc again in Nineveh with 11 seats). Second, if the persistence of demands for federal referendums was the problem for Maliki, it could have been solved much easier simply with legislative action to abrogate the law on forming regions that was adopted in 2006. This could have been done even with a simple majority in parliament and without infringing on the constitution since the right to form a region would be intact – it would just need another law to be passed. The 2-year automatic sunset clause for transfer of service ministries to local control epitomises the decentralisation extremism of these latest amendments. One small potential hindrance remains – the federal supreme court. Technically, the law is a “proposal” emanating from parliament rather than a “project” driven forward by the government, and the supreme court has in the past struck down attempts by the legislature to circumvent the executive in the legislative process. Indeed, in 2010, the supreme court veto related to a far more modest decentralisation attempt to sever the ties between a couple of service ministries and the governorates. However, this year it is noteworthy that after initial protests, Maliki’s State of Law list has remained silent about the controversial law limiting the terms of the prime minister following its publication in the official gazette on 8 April. Similarly, there has so far not been any loud indication that they intend to protest this latest law on a technicality. Amid all of this, deputy speaker of parliament Qusay al-Suhayl, a Sadrist, has resigned. That should give Iraqi politicians ample opportunity to do what they do best – disregard questions of governance and instead focus on petty personal struggles over top positions. This entry was posted on Thursday, 27 June 2013 9:38 at 09:38	and is filed under Federalism in Sunni-Majority Areas of Iraq, Iraq and soft partition, Iraq local elections 2013. You can follow any responses to this entry through the RSS 2.0 feed. Both comments and pings are currently closed. This post came timely . As for election in these two province, another point which is worth mentioning is the actuall participating rate which shows to be lass than %40. What about the new UN resolution on Iraq and chapter 7 , does it mean that the country and the government are ready to take it as an achievement and build on it to reconsider their approaches to other political issues of internal and external impot . Would you please resend your email , I was expecting to receive it but I have not. Thanks in advance . Just to be clear, everything that is being said about Iraq and Chapter 7 is just spin; there is no major change as regards debt payments. Not sure about the email reference, do you mean the subscription feature from historiae.org or an RSS feed? This looks like Maliki is calling the bluff of the federalists. Give them enough rope to hang themselves and most will, proving that they are even less capable than the central government. There is not a provincial council that can adequately provide services and spend its present allocated budget, and Maliki will be able to point to these failures in the future while relieving the pressure on himself. Wow – this is some devolution. I would be very interested, Reidar, if you could give a comparison with the United States system? I know that here in Australia our 6 states have taxing powers and responsibilities of municipalities, schools, health etc, they have their own public services, police forces etc … but not military of course. After getting over the first shock, I am actually wondering if there are some positives in this? ie that the Iraqis have matured their democratic processes to the extent that devolution to governorates is a logical response to the enthusiastic way Iraqis have participated in all these elections they have had since 2003? imo – the crucial thing that has to remain constant for this to succeed is that individual governorates are not given the power to change the voting system and choose their own for their own local power grabbing interests. Is there any hint of this happening? 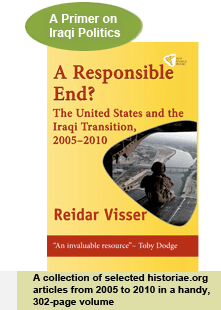 As an after note Reidar, can I congratulate on the way you keep posting these brilliant commentaries on the new Iraq given the difficulties you have been enduring personally. Thanks Bb, I think the general problem regarding so much devolution (and the reason comparisons with the US would be futile) has to do with capacity for governance in the governorates. They are already having a hard time actually spending budgets that are far smaller than what would be the outcome if this crazy scheme were actually implemented. There are also issues of scale involved here: The biggest Iraqi governorates (Baghdad, Basra and Nineveh) aren’t more populous than some of the smaller US states. Governance capacity and state size are also relevant factors when it comes to comparisons with Germany, which perhaps offers one of the federal models that is now closer to the Iraqi one than others in terms of modalities of dividing power between the centre and the provinces. Nicasso: What bluff? How can you expect an underfunded province with poor capacity and limited autonomy to provide services if they are not given the rope to do so – are you blaming the provinces instead of the state system? This is putting the cart in front of the horse. There is a bit of a catch-22 here: on one hand the central government is risk averse in allowing too much resources and authority for the provinces; but on the other hand unless these resources and authority are given, there is no way the provinces can empower themselves. It also doesn’t help that the provincial councils are so underappreciated and underfunded next to line ministries and the governor’s office. There is essentially very little representative oversight in service delivery and projects at subnational level. This is hardly the provinces’ fault only. Perhaps if given enough rope, the provinces can ‘prove’ themselves to the central government that they can become better, and even better than the centre itself, in improving the delivery of equitable and quality services. Perhaps this will lead the centre to become more confident in allowing a bit more rope again. We don’t need to shout out ‘federalism’; we should just talk about how to practically improve services, local economy, inclusive development and participation. It is quickly seen that strongly centralised governance is not conducive to any of these. Your point about aggro at provincial headquarters is also laden with prejudice that I find unfounded. Not only does the provincial level’s proximity to its citizens increase its accountability and incentives for better performance, but the proximity also allow them to get a stronger understanding of the needs and priorities at local levels. Ever tried remote management? If you have the slightest idea of how risky and detrimental to quality of work remote management is, you would understand the value of proximity and local representation and participation. If you are so unconfident towards decentralization, just look at the OSCE report on decentralization’s (fiscal, administrative and political) effect on local economy and service delivery. And OSCE is just one of many examples. There is clear evidence that decentralization can improve economy and services, even in fragile countries. There is also evidence it can greatly reduce corruption! Wallah. Finally, a little correction: provincial councils do not provide services. They only approve the provincial plan, but they do not have the authority to provide anything. They are a representative entity, like the parliament. Reidar: Thanks for the excellent analysis. Looking forward to your thoughts on the Chapter VII, as well as the Ninewa & Anbar election results.